Petitions are now available! Watch the video here!Associated students Inc., is kicking off the new year with elections! Positions up for grabs include Student Executives, Senators of Colleges and Senators At-Large. Executives serve as the primary liaisons between students and the university. They typically work 20 hours a week and receive a monthly stipend. Positions available include President, Executive Vice President, Vice President of Finance, and Vice President of External Affairs. Senators of Colleges or Schools meet regularly with their respective Dean and serve at least 8 hours per month. Positions include Senators for the College of Arts and Humanities, Craig School of Business, Kremen School of Education, Lyles College of Engineering, College of Health and Human Services, Jordan College of Agricultural Sciences and Technology, College of Science and Mathematics, and the College of Social Sciences. Senators At-Large meet and serve regularly with a designated individual who works closely with their area of specialty and serve at least 8 hour per month. Areas of specialty include Academic Affairs, Athletic and Recreational Affairs, Diversity, Equity and Inclusion, Greek Affairs, Parking and Safety, Student Affairs, Student Clubs and Orgs, Resident Affairs, Veterans and Transfer Affairs. Think you’d be a perfect fit to any one of these positions? Apply and fill out a Petition for office today! 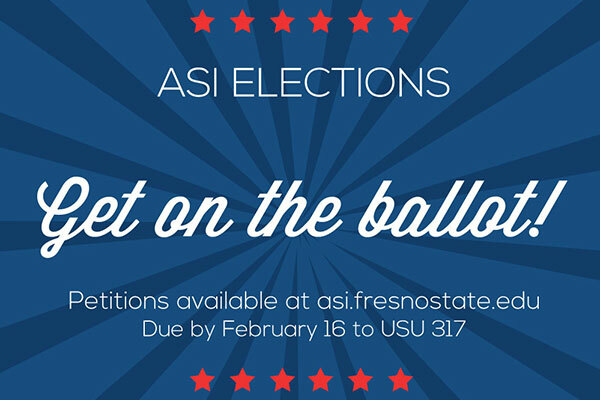 Stop by the ASI Business Office in USU 317 or get your petition online at ASI’s webpage. 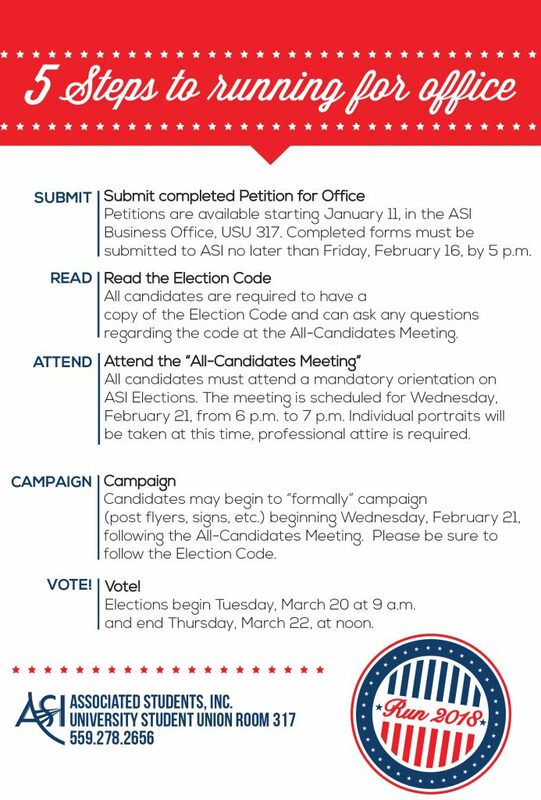 All Petitions are due Friday, February 16 by 5 p.m.
Have any questions? Give us a call at 559.278.2656 or stop by at USU 317! *Please note that 10 senators at-large may be elected, one will advance to become the Executive Vice President. Dependent upon Senate Approval, the 2018 elections may include At-large position title changes.